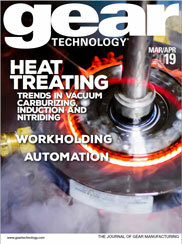 The article "US Gear Industry Doing Well, but Challenges Await" appeared in the November/December 2013 issue of Gear Technology. If you are like most navigators of the printed page, the first thing you read in this final 2013 issue of Gear Technology was our State of the Gear Industry Survey. And who would blame you? It’s not Sabermetrics, but once you’ve read it you’ll have a pretty clear snapshot of last year and a peek into the next. But if you also like to get a little closer to the bone about things, what follows are the collected opinions of five well-regarded people in the gear industry speaking to a number of issues with relevance. The article "US Gear Industry Doing Well, but Challenges Await" should appear in the box below, but if you do not see it, you can download it here.